Stuhlek, at Spital am Semmering, has an altitude of 1,783m and is the highest summit of the East Alps, and is the largest ski resort in East Austria. There is a long tradition of skiing in this area. In 1983 the first Austrian summit to be skied was here in the Eastern Alps. The Semmering Pass has been an important route and the railway has World Heritage status. Modernised rail and road links means a very quick and easy transfer from either Vienna or Graz airports. The easiest way to get to Spital is by flying to Vienna and rail or taxi transfer. The transfer time is about an hour and costs around £30 per person. 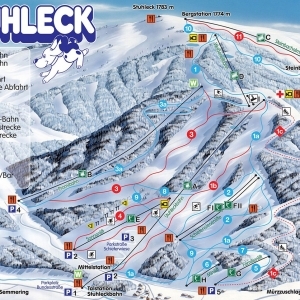 Stuhleck has 24kms of pistes, all covered by snow cannon, to ensure 100% skiability. There are 9 lifts, 2 have been installed in the last 3 years. The resort has a mixture of red and blue runs over pasture lane, so no boulders or crevasses under the snow. There is a Fun Park for snowboarders and free style skiers and a race run where you can time yourself and challenge your friends. Price guides are given for a 7 night stay. Shorter stays are possible and other than Saturday to Saturday. The accommodation rates vary through the season and with occupancy. For your specific needs, contact us and we will get you a specific quote. Prices are based on the current exchange rate and may vary, but will be fixed at the time of booking. See the YouTube video of Stuhleck, giving you an insight into this wonderful resort. CLICK HERE to view. © Ski Semmering. All Rights Reserved.